We chose this hotel due to the great price and location, inside the amazing Kappana. Apartment is Great, wide and with great view. The rooms are clean and fully equipped. The apartment is in a very clean building. It is close to the old town, shopping and restaurants. We were able to park our car in the front of the building which was very convenient. The apartment was large and had a small balcony on the front and a large terrace on the back. We found it very comfortable and well equipped. The staff was very helpful in unexpected sitiations. Location is awesome, right in downtown just a few steps from everything important. The apartment (roof top) is very spacious with 2 big balconies. Price was also very good given the location. Very clean, spacious apartments, everything you might need it’s provided. The location is very good. 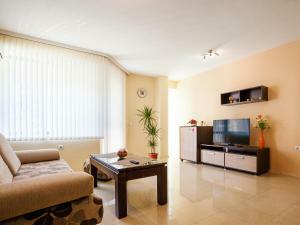 Great location, very kind and helpful stuff, always very clean, very comfortable apartment. The hotel is in the heart of the Kapana region of the town near both the town centre and the Old Town. There are plenty of street cafes and restaurants in the area and service is friendly and inexpensive. Lock in a great price for Bright House – rated 9.3 by recent guests! Bright House This rating is a reflection of how the property compares to the industry standard when it comes to price, facilities and services available. It's based on a self-evaluation by the property. Use this rating to help choose your stay! 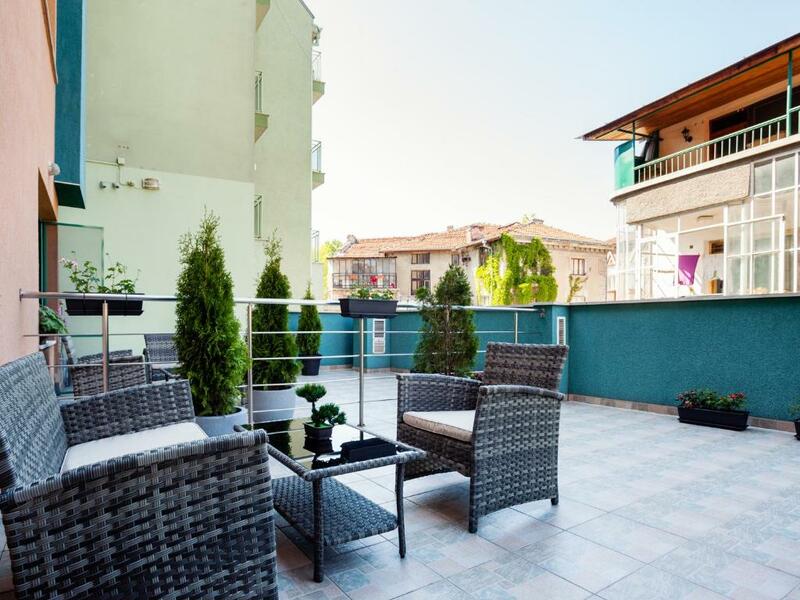 One of our top picks in Plovdiv.The Bright House is located in the very center of Plovdiv, just off the main street, and offers fully equipped modern apartments with a terrace and views of the old town. Free Wi-Fi is available. All apartments are air conditioned and feature a large living room with a seating area, a kitchenette and a dining table. 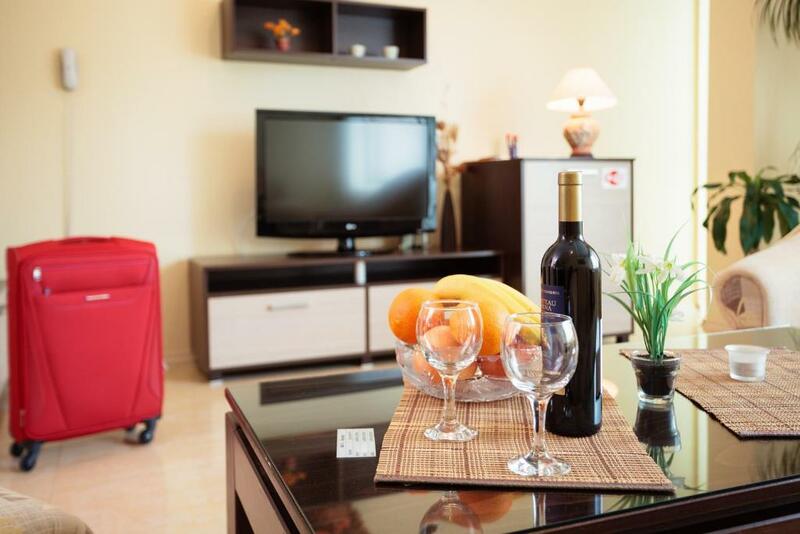 They include modern facilities, such as a flat-screen TV with satellite channels and a microwave. The property offers two parking spaces, in front of the reception and a surcharge applies. Reservation is required. In addition, guests can use a private parking at a nearby location and at a surcharge. All the clubs, bars, shopping centers, the Old City and the Amphitheater are within a walking distance. The fairground are only 1,000 feet away from the Bright House. 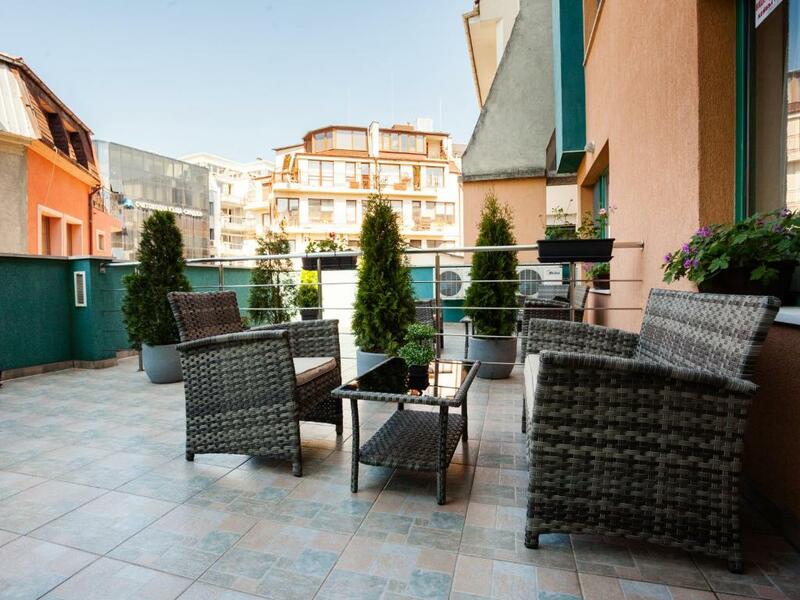 This property also has one of the top-rated locations in Plovdiv! Guests are happier about it compared to other properties in the area. 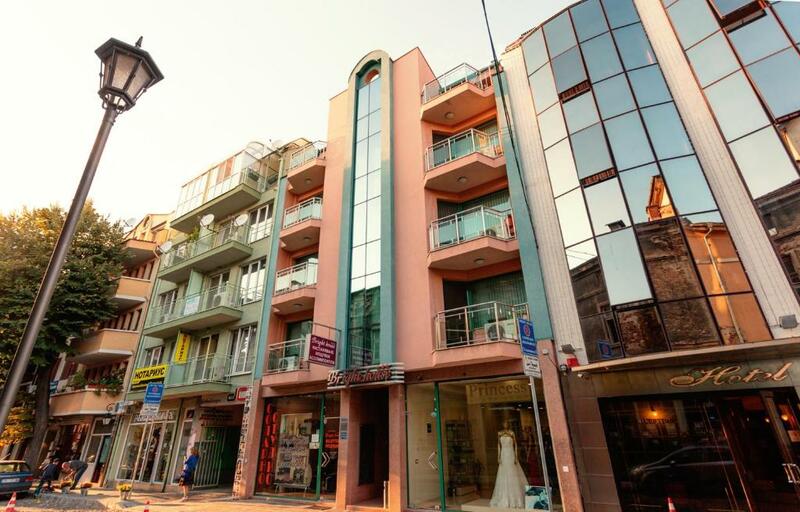 This property is also rated for the best value in Plovdiv! Guests are getting more for their money when compared to other properties in this city. 뀐 Located in the real heart of Plovdiv, this property has an excellent location score of 9.7! When would you like to stay at Bright House? 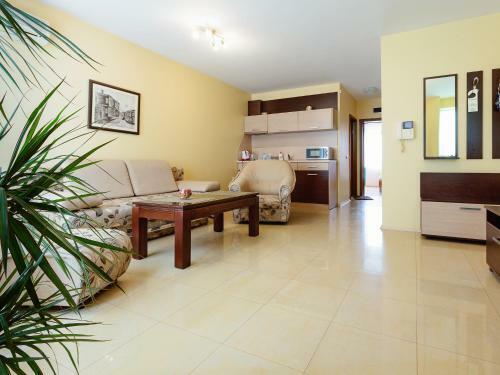 The small apartment has a spacious living room with fully equipped kitchen, one bedroom (either with two separate beds or big bedroom suite) and one bathroom. A smart flat-screen TV is featured. Private parking is available on site (reservation is needed) and costs BGN 20 per day. 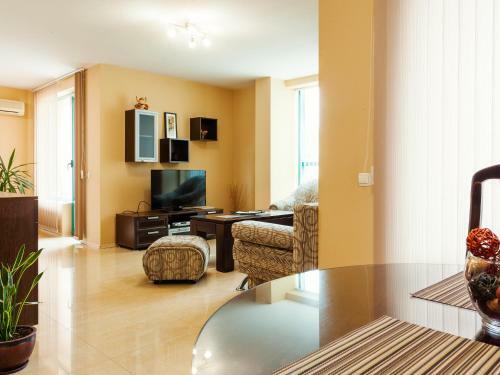 The apartment has a spacious living room with fully-equipped kitchen and an office desk. It has two separate bedrooms and one bathroom. A smart flat-screen TV is featured. This apartment has a spacious living room, a smart flat-screen TV, a well-equipped kitchenette, a bedroom, a private bathroom and a balcony. It is set on the first floor. Предлагаме на своите гости уют, спокойствие и перфектна чистота в 7 апартамента, стилно и модерно обзаведени. Аз обичам да чета книги. Обичам още да пътувам - за сега посещавам главно красивите кътчета в България и искам да я опозная, защото родината ни е наистина много красива. Обичам още да спортувам, но уви остава ми все по-малко време за това карам колело, тичам в парка . Обичам разбира се да отделям време и за семействот си, да слушам хубава музика и т.н. Свиваш небрежно от Главната в Пловдив и неусетно вече си в „Капана“. А влезеш ли веднъж в него – не ти се тръгва. Кварталът е създаден като средище на занаятчии още преди 5 века, затова не се учудвай на улици с имена като „Кожухарска“, „Железарска“, „Златарска“ и др., а името му е вдъхновено от завъртяната плетеница от малки улички. Днес в „Капана“ няма да срещнеш традиционни занаятчии, а съвременни творчески предприемачи. Ще видиш събрани на едно място галерии, работилници, ателиета, студия, уютни заведения и магазинчета, всякакви други арт пространствa, a дори и магазин за музикални плочи. Предстои да отворят врати работилница за кулинарни занаяти, италиански езиков и културен център, звукозаписно студио, арменски културно-информационен център, център за изящни и приложни изкуства, творческа работилничка за деца и възрастни, както и нова галерия и арт магазин. Всички тези места изпълват „Капана“ с модерно културно съдържание, не само с ежедневната си работа, но и създавайки събития със социален, икономически и културен ефект за града. Area Info – This neighborhood is a great choice for travelers interested in architecture, culture and Roman Ruins – Check location Excellent location – show map Guests loved walking around the neighborhood! House Rules Bright House takes special requests – add in the next step! Bright House accepts these cards and reserves the right to temporarily hold an amount prior to arrival. The mattress could be more comfortable. 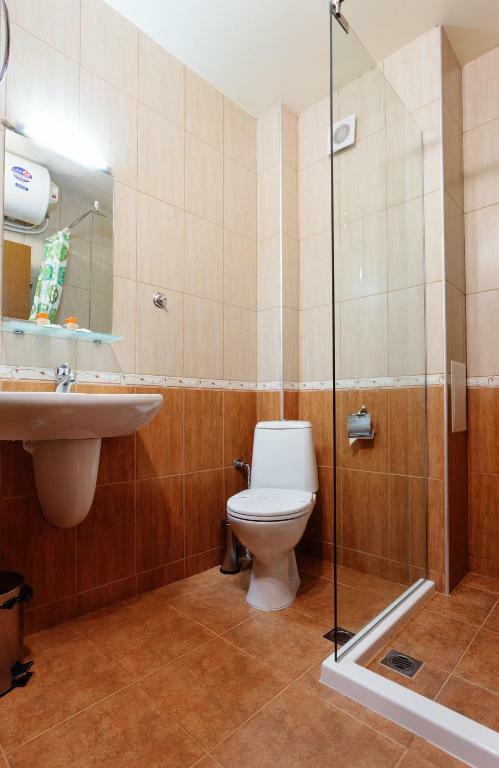 The bathroom is a bit small and everything is wet after you take a shower. WIFI does not work properly in the bedroom!! Luck of shower cabin, it was too difficult to keep the bathroom clean. The kids cannot take a bath by themselves. Everything was excellent except that parking outside the hotel was extremely limited. However the staff assisted in saving spaces whenever possible and it was possible to find parking meters by the river a few hundred yards from the property. 1. There is no elevator. Our apartment eas on the third floor and the staff did not even suggest to help with the luggage. 2. The breakfast was very bad. The boiled egg and the olives were frozen and it was impossible to eat them. 3. They have parking only for two cars in front of the hotel. The parking for charge is expensive. We were very disappointed from the support and approach of the staff. We were charged extra charge for a blanket which was a bit torn after being blamed for no reason. We also requested to cancel our breakfast due to the fact that we notice it is mainly meat and we are vegetarian, but we were ignored.